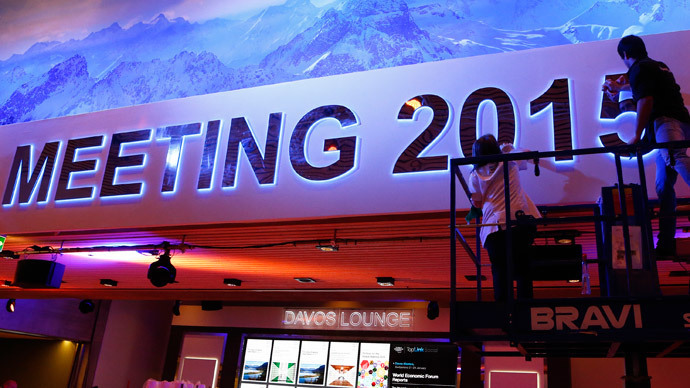 The world’s most rich and powerful businessmen, heads of state, and even celebrities are gathering in Davos, Switzerland for the 43th annual Davos ‘World Economic Forum’ to discuss business among the glitz and glamor. Monarchs, CEOS, tech billionaires, and musicians descend upon Europe’s highest city January 21-24. The theme of this year’s conference is ‘The New Global Context’, oil prices, climate change, the rise of China, deflation across the eurozone, the Russia-Ukraine conflict, and income inequality are set to top the agenda. Away from Switzerland, all eyes will be on the European Central Bank and its President Mario Draghi, who is widely expected to announce at least a €500 billion quantitative easing package for Europe, as the eurozone hasn’t managed to get its economy growing after nearly 5 years in recession. Elections in Greece on Sunday also have the EU worried of a so-called ‘Grexit’ from the euro. Leading up to the event, anti-poverty charity Oxfam has warned of the unprecedented economic inequality gripping the world. According to Oxfam, the richest one per cent will own more than half of the world's wealth by next year. Their share is soaring and went from 44 to 48 per cent in just five years. Economist Lew Rockwell believes those trying to fix things in Davos are the ones who brought about the economic problems in the first place. “It’s a meeting of the very rich and the politicians they own. They live the life of Riley at the expense of everyone else. There is a world recession going on- and it’s getting worse,” Rockwell told RT. The International Monetary Fund has cut its 2015 and 2016 forecast for global growth for every major economy, except for the United States. “The people that are making the trouble and coming up with the alleged solutions are responsible for the situation as it is,” Rockwell said. While the more power and wealth of the world assemble at the ski resort, the rest of the world is struggling to get back on track. As the world’s elite gather protestors have a history of meeting on the outskirts to protest what they see as a meeting of bigwigs. RT's correspondent Erin Ade is reporting live throughout the duration of the forum, which RT's Boom Bust will be following throughout the week. Only 400 people attended the first forum in 1971, organized by German academic Claus Schwab from the University of Geneva. Schwab organized the event and invited local industrialists, scholars, and politicians, hoping to form a ‘European Committee’, as it was first dubbed. Since then, participation has expanded to more than 40 world leaders and 2,500 businessmen, as well as a sea of journalists. Bloomberg News reports that the event brings in $52 million to the town of Davos, and more than $80 million to the greater Swiss economy. Hotel prices are known to double, if not triple or quadruple during the forum. Tickets for participants run at $50,000 per person.